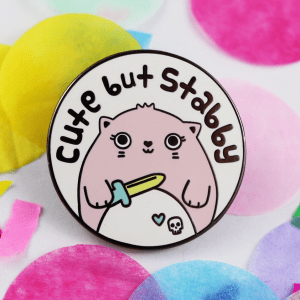 A cute glittery unicat pin badge measuring roughly 30mm high. Your pin comes with a secure pink rubber clutch back, which holds your pin securely whilst being comfortable next to skin. You can also choose to upgrade to a metal locking pin back – this is recommended for peace of mind and extra security if the pin will be worn on bags or coats etc. 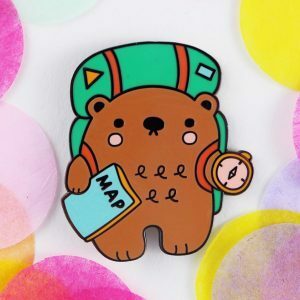 This cute pin is made from hard enamel. This makes them extra durable and gives a high quality, smooth finish. 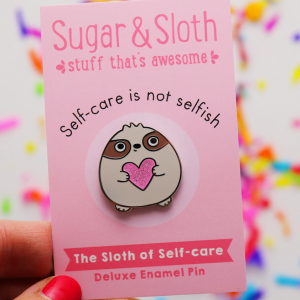 This pin can be your friend for life! The badges are displayed on cute backing cards, perfect for gift giving. Each cat enamel pin has it’s very own magical power, which will be written on the back of the packaging. Magical powers does not contain swear words and are safe for children. Although please note the pin can be sharp so is definitely not suitable for younger children.